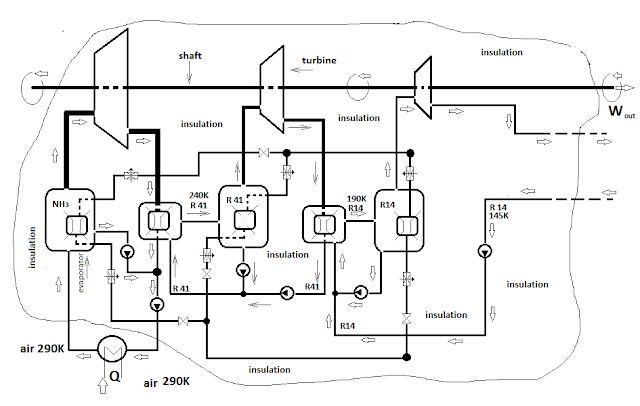 Charts 1 and 2 depict external combustion engine, such as a free cooler imaginary (as in the familiar environment external combustion engine) closes the cycle. 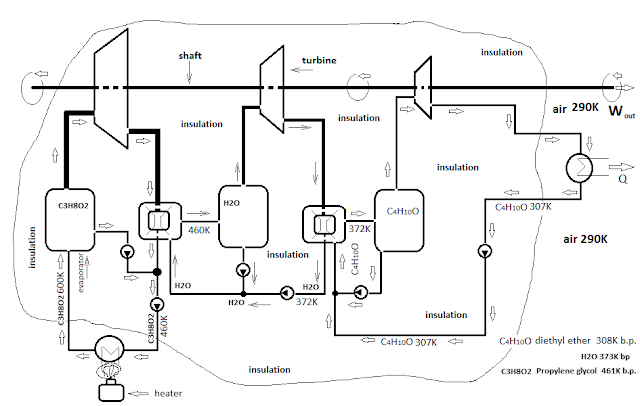 Accept that the 20% waste heat engines produced 100kW power for a given capacity of the converters of heat into mechanical energy (turbines, pistons in cylinders). 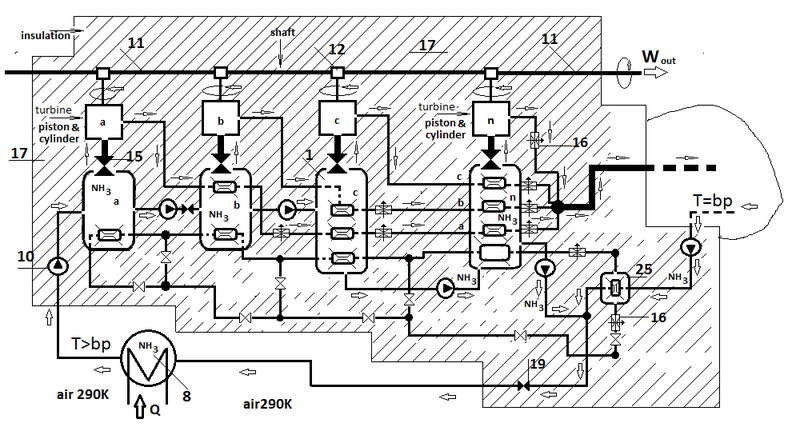 Charts 3 and 4 am figuring engines of the same capacity of the converters of heat into mechanical energy as chart 1 and 2, but here I have no imaginary "free" cooler. 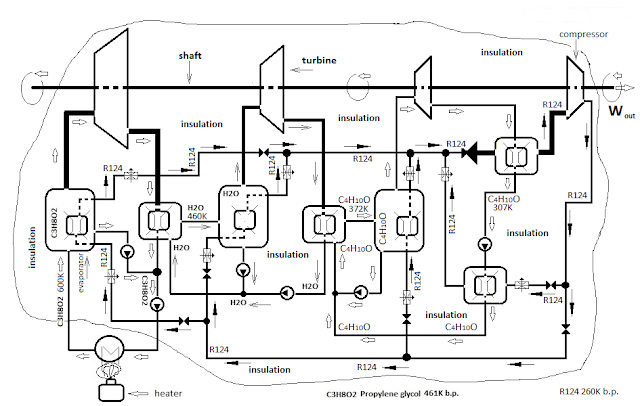 Close the cycle by using force to close the cycle - cooling gas as I use cooler - External combustion - internal cooling engines. 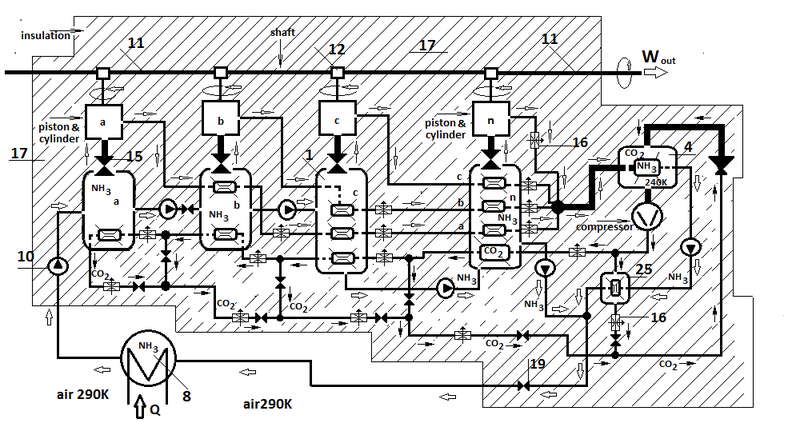 Waste heat (20%) cooler return it in the evaporators of the unit. Accept that besides waste heat in evaporators returns heat equal to the force I used to close the cycle + 20% of heat . 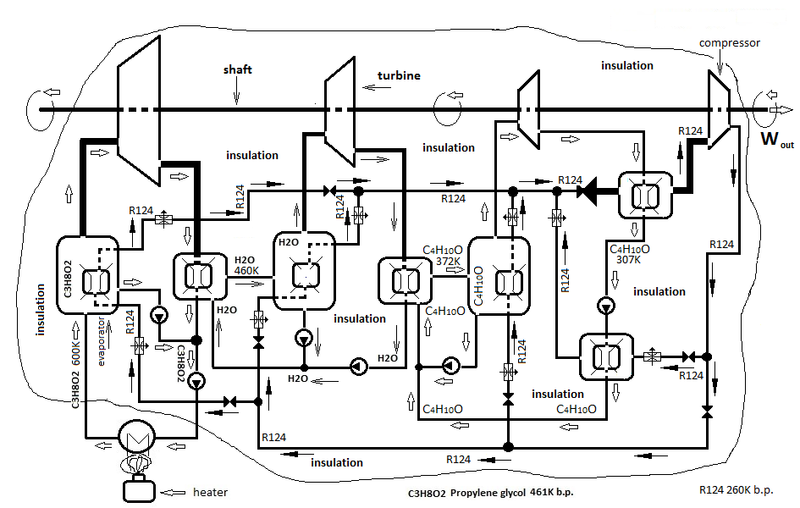 So aggregates of diagrams 3 and 4 for the same capacity of the turbines will produce 40% less mechanical energy than units with imaginary "free cooling". If a cooler is free - 100kW, and if cooling is "paid" - 60 kW of power. On chart 5 am drawn external combustion engine with real free cooler - environment. 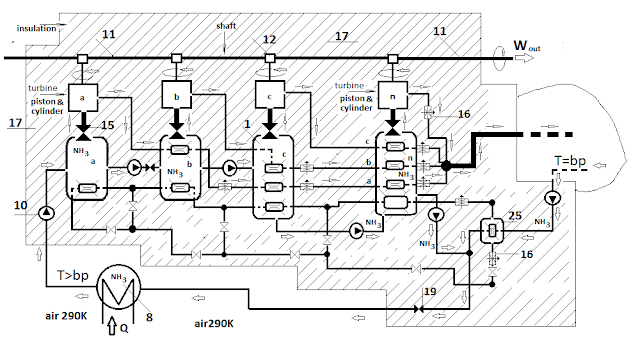 On chart 6 - engine by method - external combustion - internal cooling, with the same parameters. 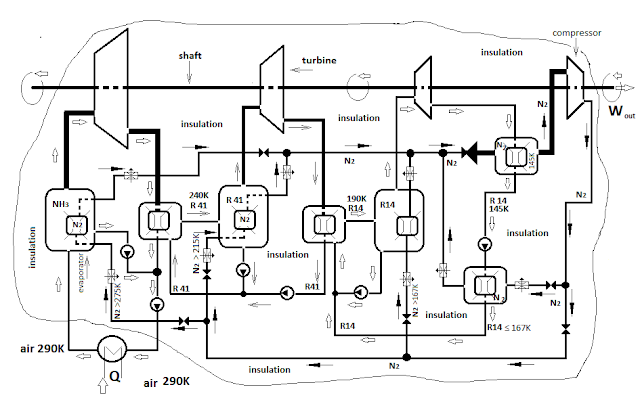 On 20% waste heat - 60kW useful power of external combustion - internal cooling engine for one and the same capacity of the turbines. 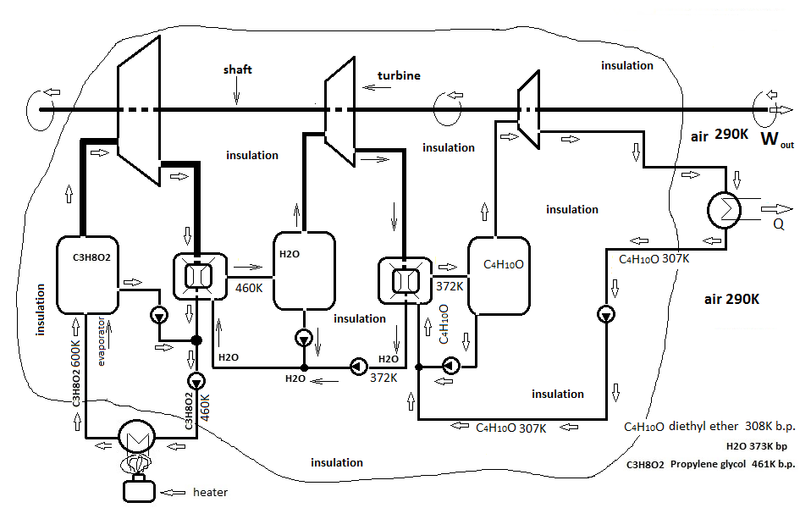 2.For the same capacity of the converters of heat into mechanical energy engine - external combustion - internal cooling gives 40% less mechanical power, but uses 40% less heat - no waste heat. 3. Another small deficiency on engine by external combustion method - necessarily need heater to heat the hot part, so that the engine to have a cold part. 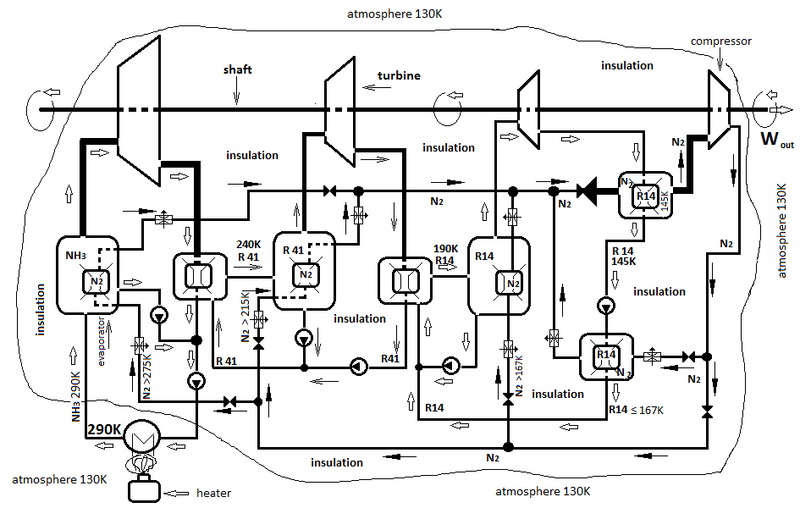 On the engine by external combustion - internal cooling method the cold part we create it, so that we can use any heat, including of heater. Let's take one external combustion engine as the chart 2 filled with the same three working substances (ammonia, R41, R14) and go to Planet X, which has an atmosphere with a temperature of 130K - chart 7. Now, for such a unit will have free cooling, as we have in mind that the last working substance (R14) has a boiling point of 145K, and the atmosphere of Planet X on which the temperature is 130K. Light a burner and heat ammonia to 290K. 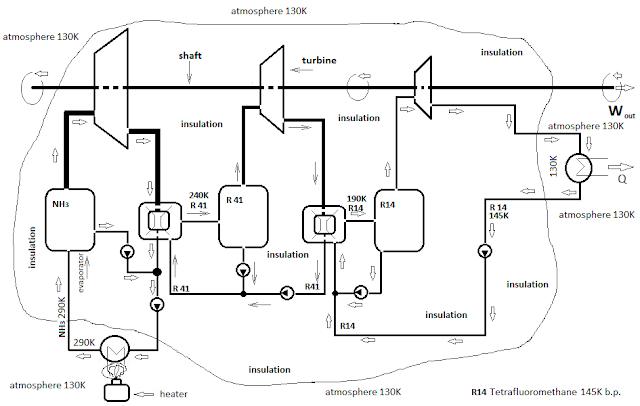 I accept that for a 20% waste heat engine will gives 100kW mechanical energy. Redesign the External combustion engine to an External combustion- internal cooling by removing heat exchanger which cools the last working substance to liquefy in the atmosphere of the planet X - chart 8. Set in its place cooler loaded with nitrogen. 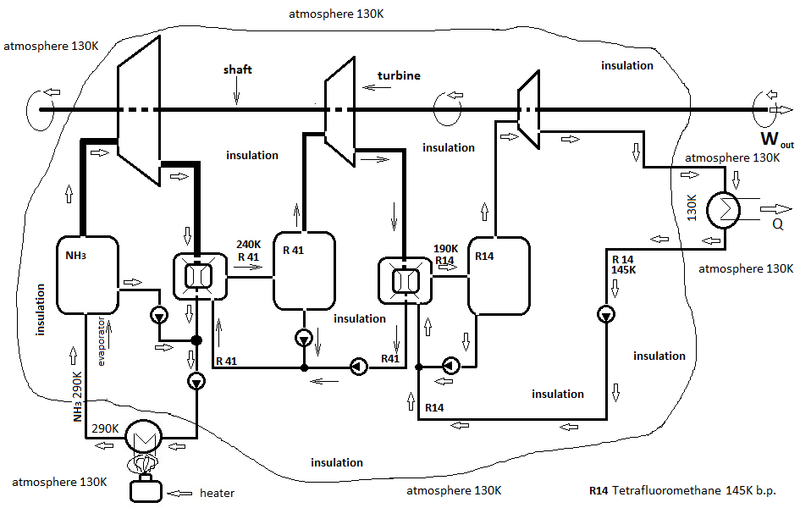 Waste heat set it back into evaporators. As I said above, now I lose 40% of the power output of the unit, but also decreased 40% fuel in the burner. On Planet X unit working with these substances can only work with heater, whether external combustion engine or an external combustion - internal cooling engine. On Earth we do not need a heater - Sun heated the atmosphere at 290K and hence heat ammonia. But on Earth mandatory for these working substances unit must be performed by External combustion - Internal cooling method, because no natural cold part. 1 With external combustion engine ever we need a heater. When using External combustion engine we pay for heating and cooling is free. 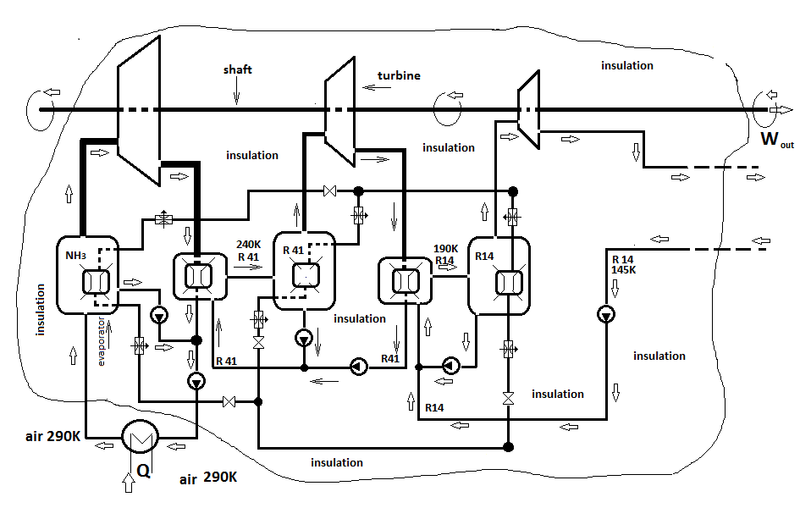 When using External combustion - internal cooling engine is not required to pay for heating, but must pay for cooling. It would be good to think about things in depth before presenting them to readers. I beg your pardon! Публикувано от Svetozar the Cold в 2:37 ч.